Located 200 metres from the Luxembourg Gardens, the second largest public park in Paris, Hotel Excelsior Latin offers 24-hour front desk reception and elegant, air-conditioned rooms and suites. The hotel is 400 metres from the famous Panthéon Church. The uniquely-decorated accommodations at Hotel Excelsior Latin have a flat-screen, cable TV and free Wi-Fi access. Some feature exposed beams and stone walls. A continental breakfast is available every morning and guests can also enjoy a drink from the vending machine. All types of restaurants and bars can be found right next to the property. You can relax in the floral courtyard. Other facilities are available such as luggage storage, a safety deposit box and a tour desk. 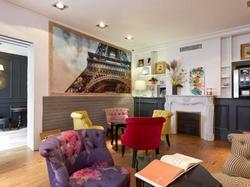 The hotel is 500 metres from La Sorbonne and a 15-minute walk from Notre-Dame Cathedral. The Musée d'Orsay is 2 km away. This air-conditioned suite offers a cable, flat-screen TV and a private bathroom. - two separate rooms - a large bathroom with shower and bath - separate toilets - The first room has two single bed (80cm by 190cm) - the second one has a large king size bed (160 cm by 200 cm) , with high confort mattress. - own private entry and 2 flat screen TV and air conditionning. This uniquely-decorated suite has a flat-screen, cable TV and free Wi-Fi access. Some feature exposed beams and stone walls. This uniquely-decorated room has a flat-screen, cable TV and free Wi-Fi access. Some feature exposed beams and stone walls.